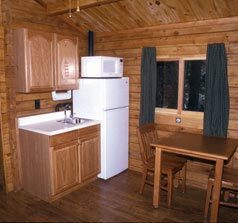 (Prineville, Oregon) - Some brand new deluxe cabins are now part of the state park’s reservation system. These measure 16 by 24 feet and are designed to sleep up to five people. Each has a six-foot covered front porch. The deluxe cabins have bathrooms with a shower, a living room with a futon that folds into a double bed, and a bedroom with a bunk bed that sleeps three-one on top and two on the bottom. They also come with a dining table and chairs, plus an entertainment cabinet with a television and DVD player. There’s a kitchenette with a sink, a microwave oven and a refrigerator. But unlike a swanky hotel, those renting the cabins must bring their own bedding or sleeping bags, as well as dishes, cooking utensils and toiletries. The new digs are available at three state parks so far. Two cabins are at Prineville Reservoir State Park in southern Oregon, and other cabins are at two state parks on the Oregon coast: Fort Stevens and Cape Lookout. Some of the new deluxe-style cabins already exist in these parks and others. Oregon now has 90 cabins in 14 in its state parks. Two thirds are still the rustic kind, with heating, lights, bed and mattresses – but no bathroom or kitchen facilities. Reservations for these parks began last week, but the cabins don’t open for a while. Fort Stevens, near Astoria, will open its 11 new cabins on July 1. Cape Lookout will open its new three on August 1. Two cabins at Prineville Reservoir State Park will open June 1. The Prineville park is located 16 miles southeast of Prineville. Fort Stevens is 10 miles west of Astoria, and also has 15 yurts to go with the largest number of RV campsites (476) in Oregon. Cape Lookout State Park is 11 miles southwest of Tillamook. The prefabricated cabin kits were put together by Oregon Corrections Enterprises, which also built their furnishings. Local contractors were hired for on-site installation and utility work. Funding for the Cape Lookout and Fort Stevens cabins came from state lottery revenue, which also paid half the cost of the Prineville cabins. Reservations for these and other state parks can be made at www.oregonstateparks.org or by calling Reservations Northwest at 1-800-452-5687. Bookings are accepted for dates two days to nine months in advance. Rental rates are available on the web and by calling 1-800-551-6949.